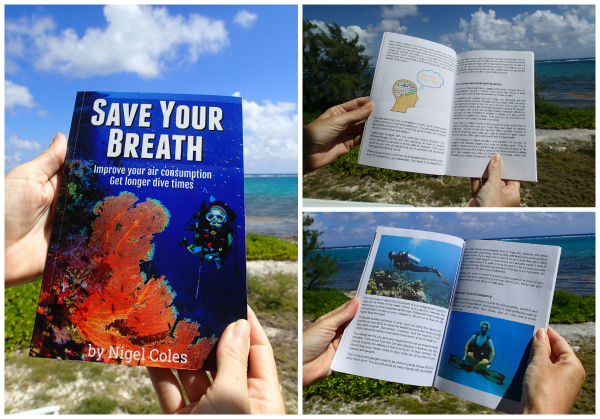 It has taken a long time to get here, but at last, I’m pleased to announce the release of my book “Save Your Breath”. Improve your air consumption. Get longer dive times. Customers have been suggesting for years that I write this book because I’m regularly suggesting tips for how to improve their air consumption and a lot of them have really benefited, and enjoy their vacations so much more. With the help of many real-life examples, this book will help you improve your dive times and ensure you have a happy buddy. 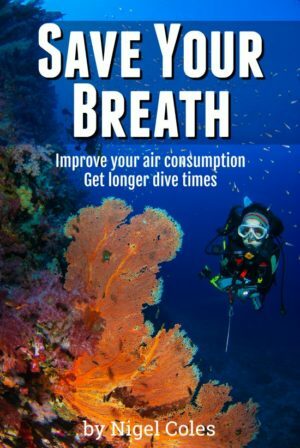 Why do you need a book about how to improve your air consumption for scuba diving? If you regularly get back on the boat first, second, third or fourth and have to wait around for all the other divers, then this book is for you. If you find yourself stressing out about the amount of air you use, which leads to you using more air, then this book is for you. If you are a relatively new diver then unless you took to this sport like a fish to water, then this book is you. If you dive with a camera and are back on the boat quicker than you would like, often missing out on cool things that came by late in the dive, then this book is for you. If you have completed dozens of dives and you are not one of the last divers back on the boat, then this book is for you. If when you go lionfish hunting, you find yourself back on the boat first, with your pals returning much later with many more lionfish, then this book is for you. Or if you just want to impress your dive guide with how much air you have left, then this is for you too! Can you really learn how to breathe less air while diving just from a book? The methods, tips and advice I give you in this book have been tried and tested in the field by real divers. Start your vacation first back to the boat, then read this book, practice the techniques and advice, and by the end of the week you could have almost doubled your dive time. I have plenty of happy dive customers who get much better value for money from their dive packages now they can stay down much longer. Guys – if you dive with your partner and you don’t stay down long enough to satisfy her, then you need this too! 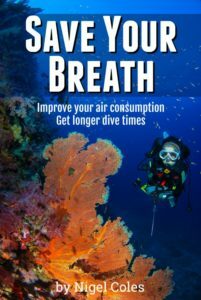 As you can see this book is ideal for many divers both inexperienced or for those who have filled up many dive logs but have not yet mastered the art of excellent air consumption. It’s an e-book download so you can read it on your laptop, tablet or phone with any PDF reader. Read it at home before your vacation, then take it with you and re-read it before your dive for last minute tips. To get your copy just click on the blue button above or below marked “Buy here”. Also, make sure that once Paypal has confirmed payment please click on the “return to merchant” button and you will then automatically be sent an e-mail from my website which will allow you to download the book. I am convinced that this book will help you. Thank you for purchasing it and please leave comments and feedback on this article. I want to know how much longer you get from your tank of air by the end of your week’s vacation. If you don’t wish to pay by Paypal then you can now purchase my book on Amazon by clicking on the link below. But if you can buy direct from me, that would be much appreciated because Amazon take a large commission. Thank you. Now also available as a paperback! Due to popular demand, the book is also now available in a paperback version so you can take it on vacation with you. Maybe read it on the plane on the way over as a good reminder and to get you off to the best start for the first dive of your vacation. The book is ‘print on demand’ so it will take about 3 weeks to be printed and sent to you, so be sure to order it well in advance of your vacation, or take advantage of the immediate delivery with the ebook version above if needed. The cost of the print version is $15 USD plus $3.99 for US postage. Use the button below and pay with PayPal for the paperback version. 16 Responses to Save Your Breath – dive and hunt for longer! Great work, Nige! For so long you’ve been promising this wonderful guide – now it is HERE! I bought it immediately and look forward to learning from your wisdom. See you again later this year. 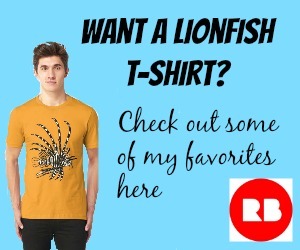 Keep culling those Lionfish – ten thousand is fantastic, but only a mark on the way to 100,000.
i would like to capture lionfish in the bahamas for sale do you know where to purchase lionfish live? I don’t know in the Bahamas. In Cayman I cannot sell any alive. I have to kill them all. My Tank was always the lowest when I came up onto the boat or shore. After reading and applying Nigels book I am now the last one on the boat with plenty of Air left. I’m really pleased to hear that Paul. I’ve had similar verbal feedback from others. And I’ve personally seen divers on Tortuga Divers boat improve their first dive after reading the book by 20 minutes. Thanks for the feedback Paul. It was a pleasure getting to talk with you a few weeks ago and getting to thank you for writing your book. All the tips in your book were really helpful, and my bottom times increased as a result of applying some of them. Thanks again! I highly recommend this book for anyone wanting to learn techniques to extend their bottom time. I hope you are well. Paper copies proved to be just too expensive for my small 42-page book. You can buy it as an ebook which you can read on your tablet or computer. Best wishes. I got a great suprize benefit from this site, a book that has changed my diving enjoyment! My wife is a new diver and our first three dives had us back on the boat early because I was low on air. I read your book and used your advice and for the first time in my 13 years of diving was the last one on the boat with 700psi air left. It gets better my next dive, again last one on the boat with 800psi.